The romance genre is always teetering on the edge of a dangerous precipice: an original plot and strong chemistry between the leads are the essential yet often elusive elements of successful romance. 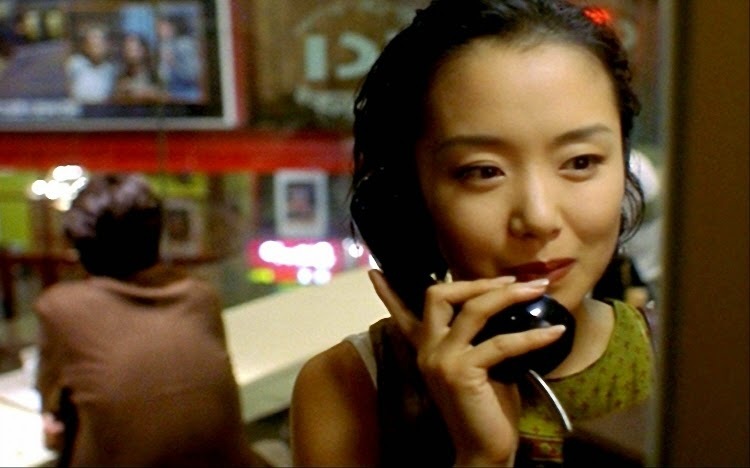 In 1997, Jang Yoon-hyeon struck gold, courting both viewer and critical approval with his hit romance The Contact. While it has its share of self-indulgence, it ultimately deserves its reputation as a refreshing genre film. The talented Han Suk-kyu stars as Dong-hyeon, a radio program producer who is still trying to get over his love for Young-hae, a relationship that did not end amicably adter six years earlier. When he receives a Velvet Underground record – one with particular symbolic importance to Young-hae – he decides to play “Pale Blue Eyes” on his program in the hopes of reaching out. At the same time, Soo-hyeon narrowly escapes a terrible car accident while listening to the broadcast. Finding some meaning behind the song and her stroke of luck, she requests the song online and opens the channel of communication between these two strangers. Jang plays both characters off of the familiar theme of unrequited love. Dong-hyeon only wants to win back Young-hae, or at least gain some closure over their split. As we learn throughout the film, some other circumstances that occurred during their break up might also be causing Dong-hyeon to feel regret as well as guilt. Meanwhile, Soo-hyeon, the breakout role for Jeon Do-hyeon, is involved in a love triangle. Her friends Ki-chul and Eun-hee are steadily dating even though Eun-hee (Chu Sang-mi) is quite vapid and Soo-hyeon and Ki-chul seem a more obvious pair. Idealized romance is clearly not interesting to Jang because almost every character in this film is involved in some sort of love triangle. Dong-hyeon’s co-worker is also interested in him and provides a hapless victim the audience can relate to as she navigates numerous office romances and ultimately helps steer the two protagonists towards each other. Jang utilizes these types of relationships to realistic effect, even if he may indulge in this theme a bit too much. Jang delights in small flourishes that add a bit of extra, natural charm to the characters. In one notable scene Ki-chul visits Soo-hyeon at the home shopping telemarketing office at which she works and he's wearing a blue tie given to him by Eun-hee, not knowing that it was actually Soo-hyeon who picked it out. He remarks that it’s the only gift Eun-hee’s given him that he actually likes, unintentionally rubbing salt in Soo-hyeon’s wound. When Soo-hyeon remarks in the elevator that it’s not tied correctly and goes to fix it the elevator suddenly fills up with other employees and they’re brought together in an awkward embrace. Jeon Do-yeon demonstrates her superb craft when she wordlessly expresses her discomfort, longing and pain all in one short scene. The film also revels in the emerging technologies of the ‘90s, with instant messaging and pagers playing an important part in the story. Current audiences will, depending on their age, chuckle in nostalgia or laugh in amazement about how quaint the technology is. Jang certainly devotes a lot of time to the back and forth Internet chats between Dong-hyeon and Soo-hyeon, sometimes for far too long as we see their conversations play out letter by letter, but the overall feeling is charming. Some other wonderful scenes, especially the jazzy opening credits sequence of a car driving at night in Seoul, transport us back to 1997 – and wow, what a difference the years have made. Ultimately, both protagonists each believe that love can only result from extreme effort and dedication: years of pining or going the extra mile. Yet despite their best efforts they each see the objects of their affections elude them. Unlike most romance films, The Contact mainly follows their individual attempts at fulfilling their disparate romantic desires, only to fail. To their credit, their emotional pain is not wasted as their circumstances only serve to bring them together. It’s an interesting ploy that is cheapened by Jang’s insistent use of coincidence throughout the film to presumably hint that fate is drawing the two together. They happen to see each other without knowing not once, not twice, but at least three times! One time would be an amazing coincidence, but three times feels like a bit much. With a stellar cast, an interesting narrative that resists some formulaic tendencies and a charming look back at how folks connected almost twenty years ago, The Contact is well worth some praise as a romance film that still stands up today. While it’s difficult to determine if it really is deserving of the ‘Best Korean Film of 1997’ title, its well-received release in the wake of the Asian financial crisis might indicate that people were in dire need of a dose of romantic optimism.